Mr. Duez - Teacher - Atascocita High: Financial Aid Even at AHS - Thursday, March 26 7 pm. 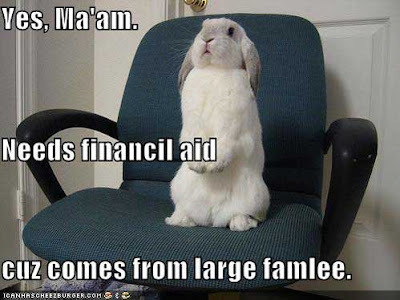 Financial Aid Even at AHS - Thursday, March 26 7 pm. College Financial Aid Event: Due to an overwhelming response to the first financial aid event hosted in January, the Humble ISD Student Support Services Department will host a second College Financial Aid Event for high school junior and senior students and their parents on Thursday, March 26, 2009, from 7 to 9 p.m. at the Atascocita High School Performing Arts Center, 13300 Will Clayton Parkway. The evening will include an overview of college financial aid, the opportunity to complete the on-line Free Application For Federal Student Aid (FAFSA) and the chance to speak to financial aid representatives from several universities including Texas Tech University, Texas A&M University, Sam Houston State University, Lonestar College Kingwood and possibly the University of Texas and the University of Houston. Sam Houston State University will have a mobile enrollment center available to provide additional on-line assistance. Please join us for this informative meeting to help students and parents gain a better understanding of college financial aid. For more information or for questions, please call 281-641-8405.